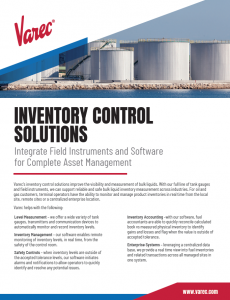 Both methods provide a direct measurement of one factor in the inventory equation, level or pressure. However, bulk storage tanks tend to have large diameters, store products with varying densities that can stratify, and require consideration for high tank levels and overfill protection. A small change in level can make a big difference in accountable volumes (level x diameter), while stratification can lead to level changes that are undetectable by mass based systems. Varec, therefore, recommends level (volume) based measurement systems. 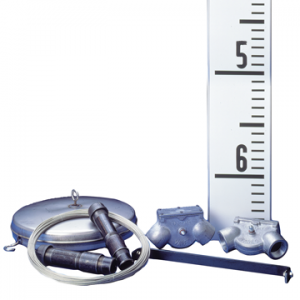 These instruments have been the liquid level measurement technique of the petroleum tank gauging market for over 90 years due to their simplicity, reliability and cost. Varec’s float and tape tank gauge solution consists of a 2500 ATG selected for the appropriate tank type. 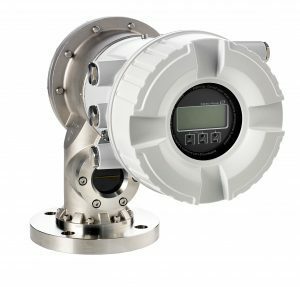 The instrument provides a measurement to +/- 4 mm accuracy and tank side display that is suitable for inventory management to API specifications. 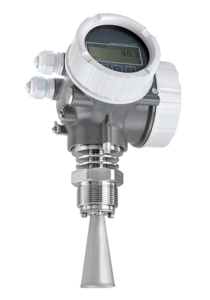 If control room integration and volumetric calculations are required, a 2920 FTT tank gauge transmitter is recommended with a 8500 STS for spot temperature measurement. The selection of the transmitter often depends on the required or existing field communications and protocols. The 2500 ATG/2920 FTTcombination is ATEX approved and is also able to provide optional contact outputs for triggering alarms or relays. If only an analog (4…20 mA) level output is required (without temperature) the 8200 COT can be used. Varec provides radar tank gauging solutions for inventory control and high accuracy applications. 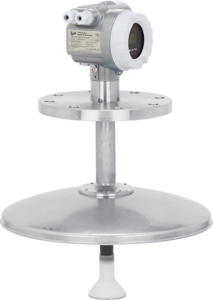 Radar devices provide non-contact measurement with high reliability and low maintenance. Varec’s servo tank gauging solution consists of the NMS80 PTG and NMS81 PTG that are able to measure level to +/- 0.4 mm accuracy. They are able to determine the interfaces between three liquids, the specific gravity of these liquids and tank bottom. 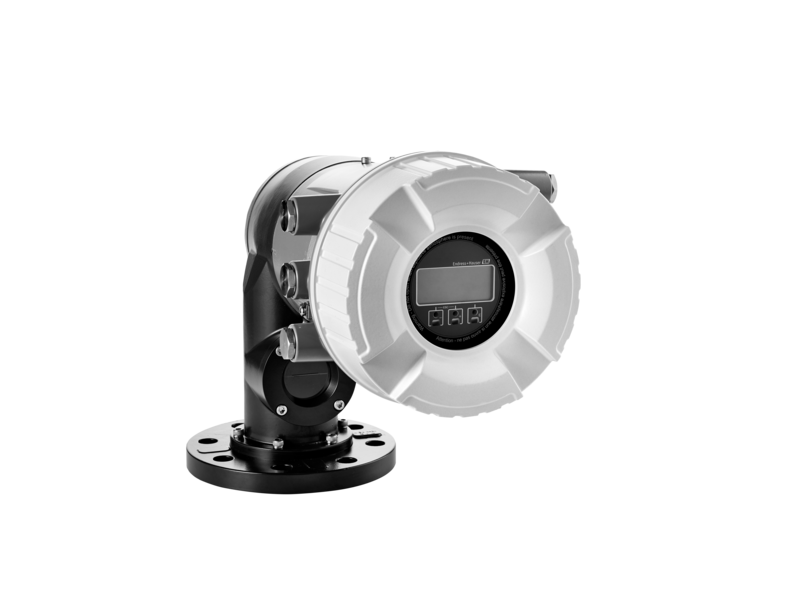 This allows the instrument to provide spot density measurements, profile the liquid density throughout the tank, or profile the stratified upper layer. The 4532 ATC (or 4539 ATC) can be selected for temperature measurement suitable for inventory management (or custody transfer, NMi approved) applications. The servo tank gauging solution can be selected with FM, ATEX or CSA approvals and the appropriate field communications protocols for data transfer to the control room system. 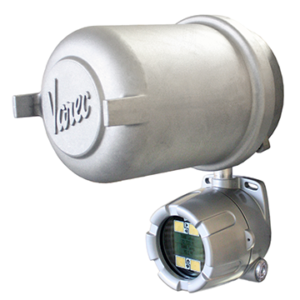 Varec servo tank gauges operate on the principle of displacement measurement. A small displacer on a measuring wire is unwound from a drum and accurately positioned in the liquid medium using a servo motor. The weight of the displacer is precisely balanced against a magnetic coupling and the wire drum. When the displacer is lowered and touches the liquid, the weight of the displacer is reduced because of the buoyant force of the liquid. As a result, the torque in the magnetic coupling is changed and this change is measured by 5 sets of Hall sensors (U.S. patent). The signal, an indication of the position of the displacer, is sent to the motor control circuit. As the liquid level rises and falls, the position of the displacer is automatically adjusted by the drive motor. This system provides an outstanding accuracy of +/- 0.7 mm. Servo gauges are ideally suited for light and middle distillates of petroleum. 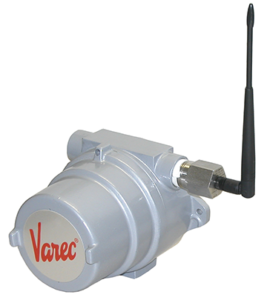 Varec provide radar tank gauging solutions for inventory control and high accuracy applications. 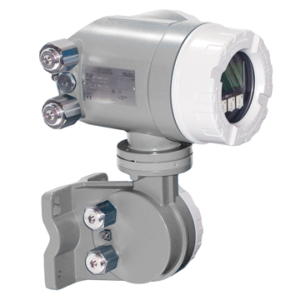 Radar devices provide non-contact measurement with high reliability and low maintenance. 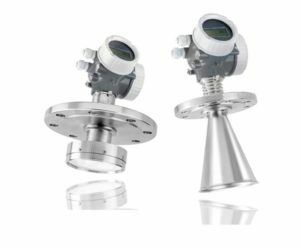 Varec’s radar tank gauges are suitable for most bulk storage tank applications to provide inventory management level (+/- 2-6 mm) measurement accuracy or NMi approved high accuracy (+/- 1 mm) respectfully. A 4590 TSM is required to integrate a temperature device. A 4532 ATC, 4539 ATC, 3-wire RTD or 4-wire RTD can be selected for temperature measurement suitable for inventory management applications. The 4590 TSM also provides power to the radar tank gauge and additional functionality, such as I/O, tank calculations, pressure (HART®) sensor integration and the appropriate field communications protocols for data transfer to the control room system. Radar tank gauges are “downward-looking” measuring system installed on the tank roof. Operating on the time-of-flight method, they measure the distance from the reference point (process connection) to the product surface. Radar impulses (FMCW principle) are emitted by an antenna, reflected off the product surface and received again by the radar system. The distance to the product surface is proportional to the travel time of the impulse. Due to the nature of the microwave, radar tank gauges need to be equipped with functions to suppress interference echoes (e.g. from edges and weld seams) in the tank so they are not interpreted as level measurement. 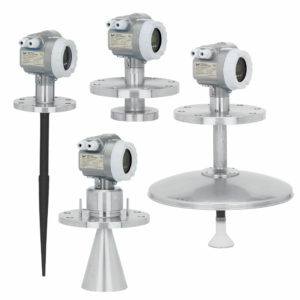 Radar technology is suitable for measuring a wide range of petroleum products. Radar gauge measurement is independent of the process conditions inside the tank. Temperature, pressure and gas vapors have minimal affect on “radar beams”. The dielectric constant of the liquid being measured is a critical factor when considering a radar tank gauging solution. 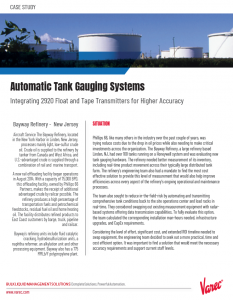 Tank gauge transmitters vary in capabilities and application, from simple indication of alarms or relays, to level encoding and temperature measurement integration. visualize gauge data via your control room computer system? use standard net volume or mass calculations for accounting? integrate gauge data into PLC or DCS systems? 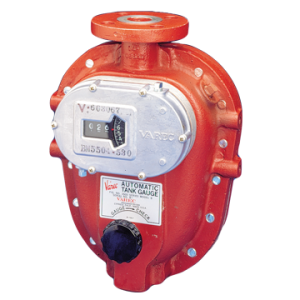 Varec’s 2920 FTT can offer a solution for accurate encoding, level alarms, relays, temperature measurement, tank-side display and system integration. Transmitters convert the measurement parameter (rotation, resistance, etc.) to an electrical signal for transmission over an instrumentation field bus or communications loop. Most transmitters use an incremental or absolute encoder with either brush, optical, magnetic or the latest capacitive sensors. Incremental encoders count steps up or down to find level and then store the information in memory. A power loss can causes the transmitter to forget where it is, so recalibration or a battery backup may be required. Absolute encoders count the absolute position on the encoder disc to find level. After a power loss the encoder knows where it is, so no battery backup and no recalibration is required. Brush sensors make contact with the encoder disc causing the encoder to wear down over time and brushes may “feather”, which will affect the accuracy or reading. Brush sensors need replacing every 5-8 years. Optical sensors, either linear or reflective, do not make contact with the encoder disc. Sunlight may affect calibration (except with infrared sensors) and photo-etched (painted) discs may fade, affecting the reliability and accuracy of the reading. Varec’s 2920 FTT uses the latest capacitive sensors with gold plated etched discs to provide maintenance free operation with the most accurate output to on the market to date. Temperature sensors connected to the transmitter allow the inventory system, such as FuelsManager®, to calculate volumes that are temperature corrected. 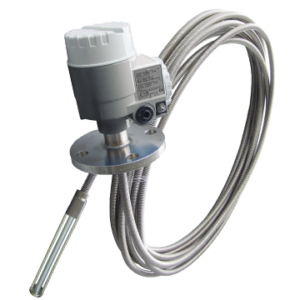 Spot temperature sensors are appropriate for float & tape tank gauging, while average temperature devices are generally associated with radar or servo tank gauges due to the increased accuracy obtained from the level device. 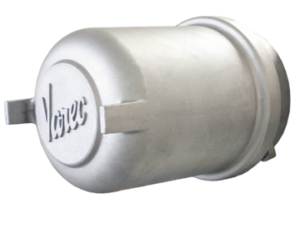 Varec temperature measurement devices range from simple spot measurement bulbs to more complex multi-element sensors and transmitters, capable of measuring the temperature at different heights in the vessel. 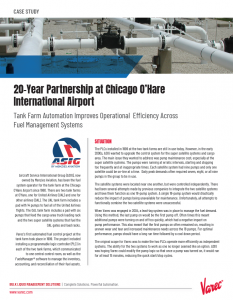 Using temperature compensated volumes allows tighter control of all tank farm liquid inventories and it allows balancing book vs. physical inventories more accurately. 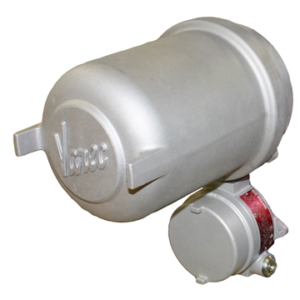 Varec recommends using a multiple element device, such as the 4532 ATS or 4539 ATS to provide the average product temperature in large bulk liquid storage tanks. 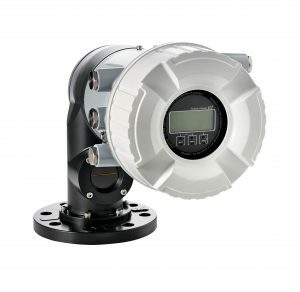 Alternatively use a 8500 STS to provide the temperature of liquids at a single localized area, such as at or near the bottom of a storage vessel or in a pipeline. In order to determine net standard volume in the oil and gas industry, it is necessary to measure the temperature of the product. Once the product temperature is known, it is possible to calculate the volume at an internationally agreed upon ‘standard’ temperature – typically 15°C or 60°F. A temperature change of 1°C causes a change in volume of about 0.1%. The American Petroleum Institute (API) and American Society for Testing and Materials (ASTM) recommend a minimum of three temperature measurement devices for inventory control applications and a minimum of six points for custody transfer applications. The more elements used, the more accurate the measurement. In practice, between one and sixteen temperature elements are used in a tank. 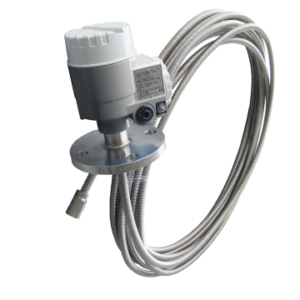 Varec’s hydrostatic tank gauging solution consists of a temperature sensor and one or more HART®pressure sensor(s) integrated into the 4590 TSM. The 4590 TSM Connects up to 6 HART devices via an intrinsically safe 2-wire loop and a 3-wire RTD, 4-wire RTD 4532 ATC or a 4539 ATC. The 4590 TSM is then able to provide calculations at the tank side and transfer data to the control room. Hydrostatic tank gauging utilizes up to three pressure sensors and one or more temperature elements. The hydrostatic pressure (liquid head) is measured; as the height increases the pressure increases as well. If a single pressure sensor is used, a manual density measurement is required for an inventory calculation. A second pressure sensor is used to enable automatic density calculations. 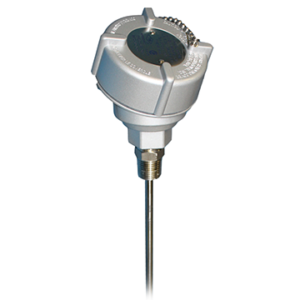 A third pressure sensor is generally used to measure vapor pressure and increase the overall accuracy of the system. Combined with the tank strapping table, this technique provides an excellent method to measure mass, but liquid level, volume and density are only indirectly inferred. A 0.02% full scale accuracy, which is dependent on the pressure sensors installed, is normally desired to provide reasonable inventory management. Varec’s primary hybrid tank gauging solution consists of a level instrument (tank gauge), a temperature sensor and HART® pressure sensor(s) integrated into the 4590 TSM. The level gauge selected depends on the product application at hand. 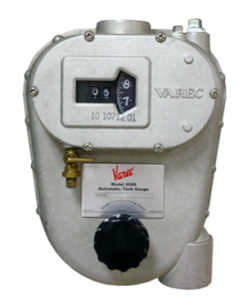 In the case of light distillates, Varec would recommend a servo or radar gauge, combined with a 4532 ATC (or 4539 ATC) based on the requirement for inventory management (or custody transfer, NMi approved) applications. The 4590 TSM is able to provide hybrid calculations at the tank side and transfer of data to the control room. Alternatively, FuelsManager can replace the tank side device to perform hybrid calculations. In this solution, either a servo gauging system or a radar gauging system and pressure device can be used to supply the required measurement data.